After Brahmanism, the religion that is mentioned most often in the Tipitaka is Jainism. Of course the names Jain or Jainism are not used; they only came into vogue some time after the Buddha. In the Tipitaka the Jains are called Niganthas (nis + ganthi = without bonds) and their leader and teacher Mahavira (Great Hero) is called Nigantha Nathaputta (Son of Natha). The Tipitaka shows that a spirit of intense competitiveness prevailed between the Buddhists and the Jains. The Buddha was often critical of the brahmans and their beliefs and practices but he just as often praised them, at least those who practiced the ideas they espoused. But of the Jains he hardly had a nice thing to say. I suspect there were two reasons for this. Firstly, the Buddha was about 20 years younger than Mahavira; he was, in effect, ‘the new kid on the block’ within the samana movement. Secondly, his teachings are very close to Mahavira’s, perhaps too close for comfort. Other than their understanding of kamma the two men’s vision of reality was very similar. (Paradoxically, what Mahavira taught about kamma – that everything we experience is due to our past kamma – is exactly what many Buddhist monks today teach) That the Buddha himself felt insecure about this, I find hard to imagine. But that those who compiled the Tipitaka did, there can be no doubt – and they projected their insecurity onto the Buddha. That was fast! Great post on the Jains, especially the title. Do you know the history of Jainism? Which school came first, the Svetambara or the Digambara? Based on the information from the Canon about "naked ascetics" it would appear that the Svetambara was a later development. Do you agree? I thought all jains are naked!! The Svetambara school does not do naked monks and they also accept that women are capable of moksha, whereas the Digambara does not. The Svetambara also believes that a previous Tirthankar (enlightened saint) was female, an aspect that even Buddhism can't directly claim by the scriptures of Buddhism as all 28 prior sammasambuddhas were male. But my thinking is that the Svetamabara was a later development, perhaps after seeing the popularity of Buddhism? 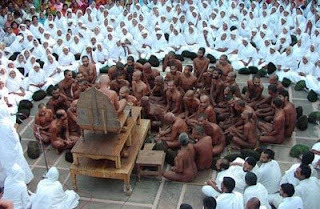 As far as I know the Digambaras are the old unreformed school of Jainism, they hold to the old scriptures; the Svetambaras are the reformed movement and they wrote new ones. Digambara means "clothed by the sky" (ie naked); Svetambara means "clothed in white". Does this only applies to the Jain monks, or all the practisioners? Yes, it only applies to the monks. The Digambara goes naked, the Svetambara monks do not. Lay people and nuns keep their clothes on, thank goodness! IT IS APPALING TO LEARN YOUR SUCH LITTLE AND BIASED KNOWLEDGE OF JAINISM AND RELATIONS OF MAHAVIRA AND BUDDHA.BUDHA HIMSELF HAD ADOPTED JAINISM FIRST BUT HE FOUND RULES OF JAINISM FOR MONKS VERY STRICT AND ON THE OTHER HAND IN THE HINDUISM IT WAS FOUND ONTO OTHER EXTREME AND THAT IS WHY BUDDHA ESTABLISHED NEW PATH-MAJJHIM NIKAY-MIDDLE PATH.I'LL QOUTE IN FUTURE WHAT BUDDHA SAID OF NAATHPUTTA-MAHAVIRA.ON LEARNING NEWS OF NIRVANA OF MAHAVIRA, BUDDHA CAME TO PAWA ON THAT MORNING. Dear David, I think the only reference to the Buddha's former teachers is in a Jain work called Isibhasiyam which mentions a sage named Ramaputta and gives a brief outline of his philosophy (Is.XXIII). Dear Zen, the Middle Path is majjhima patipada; majjhima nikaya is the name of a book. My gratitude to the ones that keep some clothing on. I'm pretty sure a little clothing never hurt anyone's karma.